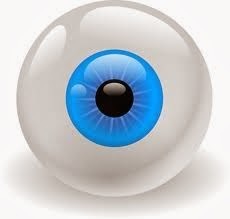 Russ Chaplin's Driving Instructor Blog: Move Those Eyeballs! You would think by the way that some people drive that their eyeballs were glued into their sockets. Staring relentlessly ahead at the back of the car they are following while excluding everything else. This is not the best way to go about things. It can lead to problems for learner drivers as well. Staring ahead at the road surface about 20m in front of the bonnet gives a feeling of safety. If you keep looking there you can't run into anything right? Wrong. Looking at the road leads to poor steering as the eyes turn towards the kerb and then over to the centre line. You will always drive where you look so swerving all over your lane is the result. When turning into a junction you must look into the new road. Not at the corner of the kerb or you'll go wide and strike it. You need to see any parked cars near the junction as well so you can avoid them and leave plenty of room. Generally moving the eyes around allows you to pick out hazards early and steer a safe course. So this is the best way to go. Feeling nervous will make you stare at one spot so relax and take in the whole scene. Where can I get info on the ADI qualifying exams?